Ahead of Sunday's $10 million GTD event, we look at some of the biggest Sunday Million tournaments ever. Most players will never win the Sunday Million in their lifetime, this player has won it three times! 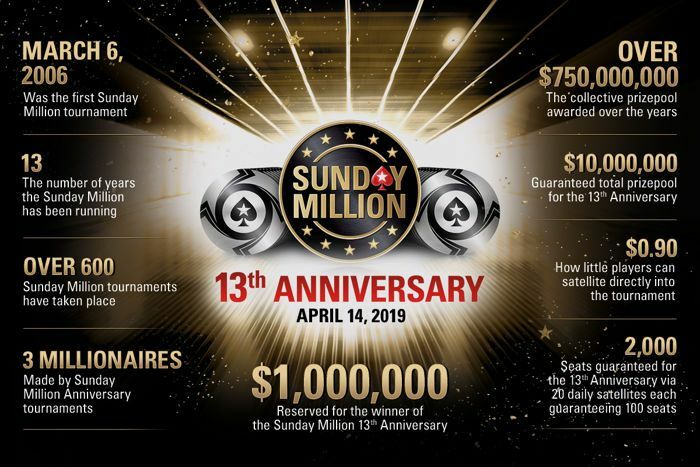 The PokerStars Sunday Million celebrates its 13th anniversary on April 14 and is doing so with a $10 million guaranteed anniversary special edition that has a massive $1 million reserved for the eventual champion. You have to go all the way back to March 5, 2006 to find the inaugural Sunday Million. A field of 5,893 players exchanged $215 for the chance to become the first-ever PokerStars Sunday Million champion. That player was “aaaaaaaa” who got their hands on the $173,843 top prize and a place in online poker’s history books. There have been a grand total of 613 more Sunday Millions since “aaaaaaaa” triumphed in that first-ever tournament. More than 4.8 million players have played in the Sunday Million during that time with the collective prize pools weighing in at over $750 million. 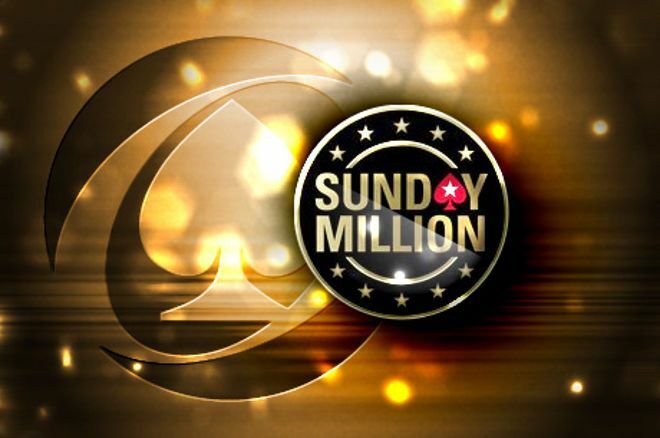 Special editions of the Sunday Million have always proven popular and have broken plenty of records. The Sunday Million 4th Anniversary tournament boasted of a $4 million guarantee, in February 2010. Any fears of not hitting the ambitious guarantee were soon dispelled as 36,169 players bought in to create a monster-sized $7,233,800 prize pool. The aptly named “RichieRichZH” won this particular event and the first seven-figure prize awarded in the Sunday Million, a cool $1,141,510. The Sunday Million that took place on Dec. 18, 2011 and broke the record for the largest online poker tournament ever was part of PokerStars's 10th Anniversary celebrations. A field of 62,116 players built a $12,432,200 prize pool, a sum that would hold the record for the best part of seven years. Canada’s Kyle “First-Eagle” Weir was the victor on that occasion, walking away with $1,146,574 after a six-way deal; this is still the biggest prize awarded in the Sunday Million. With such large fields, usually several thousand but sometimes in the tens of thousands, you would think it would be all but impossible to win the Sunday Million more than once. You’d think wrong. Danish pro Jesper “KipsterDK” Hougaard had already become the first poker player to win both a World Series of Poker bracelet in Las Vegas and at the WSOP Europe. Then, in May 2009, Hougaard did the unthinkable and became the first two-time Sunday Million champion. Amazingly, 15 other players have emerged victorious in the Sunday Million twice, with one star having won it an unbelievable three times. Russia’s Artem “veeea” Vezhenkov took down the Sunday Million in November 2015 after outlasting 5,295 players to secure a $83,675 prize. Less than two years later, in July 2017, Vezhenkov was the last player standing from a field of 5,554 entrants to scoop $166,530. Fast forward to October 2018 and Vezhenkov became the first and only (to date) three-time Sunday Million champion when he triumphed over 5,235 opponents to bank another $141,494. Vezhankov even has a third-place finish in the Sunday Million so was close to being a four-time champion! This Sunday, April 14, PokerStars is celebrating the 13th anniversary of this fantastic tournament by guaranteeing at least $10 million will be won and reserving $1 million for the tournament’s champion. Although the buy-in for the Sunday Million has dropped recently from $215 to $109, this special edition event sees the return to a $215 buy-in as a nod to the history of the Sunday Million. Several thousand poker players from all corners of the planet are expected to descend on PokerStars for the $10 million guaranteed event, many of them former Sunday Million champions. Perhaps Vezhenkov can pull a fourth victory out of the hat, or maybe it will be your name adorning the PokerNews pages on April 15 having been crowned the latest Sunday Million conqueror. Who will join Sunday Million's long and illustrious history this Sunday? The world's largest online poker room has an unrivalled choice of cash games, tournaments and is the home to the famous Sunday Million - the biggest weekly tournament anywhere in the online poker world. Check Out these PokerNews-Exclusive $2K Freerolls and Money Added PKOs at PokerStars!